Maptitude for Redistricting is now available as an ArcGIS extension. As a result, you have access to the redistricting functionality and ease-of-use of Maptitude for Redistricting while leveraging your in-house expertise in ArcGIS software and all of your existing Oracle, SQL Server, DB2, and other data through the ArcGIS DBMS support. With the ArcGIS redistricting extension, you can integrate online content from Esri and Microsoft's Virtual Earth to create more informative maps for building districts and more professional maps for printing. You can also export your plans to Google Earth. The ArcGIS redistricting extension features a Plan Manager that serves as your redistricting control center. Use it to organize plans, create any number of plan types (e.g., congressional, state house, state senate, and school district), and save them as Plan Templates. To create a plan, simply choose a template or an existing plan and enter a new name. You can organize plans in libraries by plan type, user, security access, etc., and you can locate, copy, change settings, and password-protect plans. Create a new plan from a map or template. You only have to enter the settings once. From then on, you can create a new plan by picking the appropriate template or existing plan. 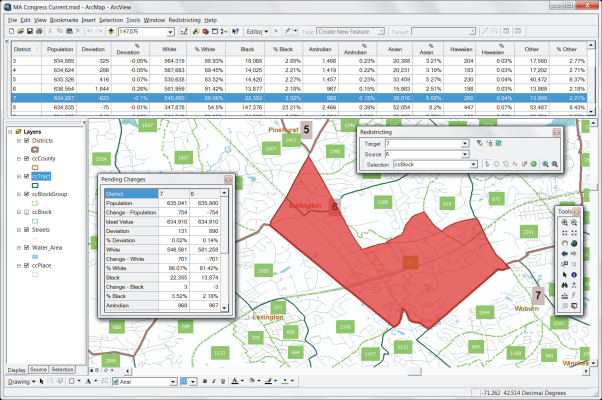 Import and merge plans created with the extension or other redistricting software. Designate the control field, number of districts, ideal value, and summary fields. Include any number of data fields in the same plan; a one-button toggle between field sets lets you display only the data of interest at any particular time. Assign both an ID and a long name to districts, rename districts, lock districts, and manage multiple districts. Add areas from any geographic layer to a district by clicking, by dragging a box, by circle, by polygon, or by line. You can select from the entire jurisdiction or limit the selection to unassigned areas or one district. As you add areas to a district, Maptitude for Redistricting redraws the district boundaries and updates the control and summary fields to reflect changes to the current plan. Find unassigned areas and noncontiguous districts. Toolboxes make it easy to zoom to and fix problems. Identify communities of interest. Keep them intact within the same district, and lock them so that you cannot accidentally reassign them to different districts. Alternatively, for communities that you do split into multiple districts, run the Communities of Interest reports to calculate the total and percent population of the community in each district. Compute measures of compactness to assess or defend the districts in a plan. Maptitude for Redistricting computes all of the recognized measures of geographic compactness including the Reock, Schwartzberg, Perimeter, Polsby-Popper, Length-Width, Population Polygon, Population Circle, and Ehrenburg metrics. Export to standard equivalency file formats that can be read by other redistricting software and the Department of Justice. Generate and print over 35 reports including population summary, error check, political subdivision splits, incumbents, plan statistics, plan components, plan comparison, communities of interest, measures of compactness, and more. Create custom reports and add them to the report menu. The Maptitude for Redistricting Extension for ArcGIS is compatible with ArcGIS 9 and newer. Maptitude for Redistricting Extension for ArcGIS includes online help and detailed manuals packed with step-by-step instructions and tutorials. The Plan Manager leads you through the process of creating your first plan and speeds the creation of all additional plans. Caliper also offers classroom training at your site or at our headquarters in Newton, Massachusetts. With the Maptitude for Redistricting Extension for ArcGIS Plan Manager you can easily manage an unlimited number of plans stored on a computer network. You can quickly find a plan by type, creator, date, key word, etc. The Plan Manager lets you distribute plans for viewing and perform plan management functions across your organization. Data and plans can be stored on individual machines or on one central server with access controlled by both the extension and the network administration software. For more information on the Maptitude for Redistricting ArcGIS Extension, please download the brochure or contact Caliper Corporation (email: sales@caliper.com or call +1 617-527-4700). Caliper provides database development, classroom and web-based training, software customization, web design, telephone support, on-site support, priority support, and other related consulting services on a time and materials basis. Caliper Corporation is a leading developer of transportation and Geographic Information System (GIS) software and applications. Caliper software is used by more than 70,000 users in over 70 countries.